"The rich and powerful take what they want; we steal it back for you. Sometimes bad guys make the best good guys. We provide... Leverage." 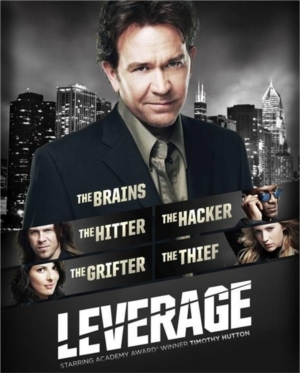 Leverage (2008-2012) is a crime dramedy which follows the exploits of Leverage Consulting & Associates, a team of heroic criminals led by a former insurance investigator. The team takes a modern-day Robin Hood approach of finding people and corporations who have committed wrongs and attempting to restore justice as they see it, using their skills to run elaborate Ocean's Eleven-style cons on their targets. Think of them as a modern-day version of Mission: Impossible or The A-Team. The show finished its fifth and final season after TNT opted not to renew it for a sixth. However, the franchise is being continued through tie-in novels and role-playing games . One of the show creators is John Rogers, better known on the Internet as Kung Fu Monkey . If you see something about the show cited as Word of God, it probably comes from somewhere on his blog. This show has a work-in-progress character sheet and Episode Recap. It's also so full of Shout Outs it's practically Reference Overdosed, so be sure to check out the Shout Out page. It has an across-the-pond counterpart in Hustle. While the general concept is the same and at least one prominent guest star appeared on both shows, the two shows are unrelated.